Customized duck shape bottle opener animal keychain offers you streamline buoyancy to float in harsh competitive waters. 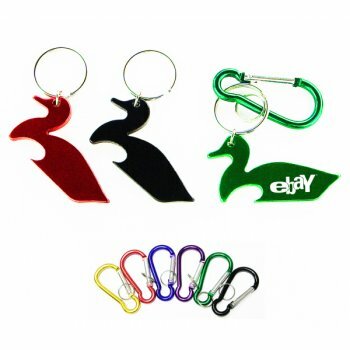 This duck shape keychain can be availed at excitingly low prices by ordering in bulk. It is perfect for advertising schools, art and craft supplies, sports events, awareness events, fundraisers and many more. This animal keychain can be availed by most small budget marketers who wish to attract large segment of customers during tradeshows or exhibitions or other mass competitive events. Request a quote to know discounts that you can avail on wholesale promotional duck shape bottle opener animal keychain. Features – Duck shaped aluminum body in metallic finish with carabineer. Product Size – 2 5/16" x 1 3/16". Available Colors - Metallic Blue, Metallic Gold, Metallic Black, Metallic Purple, Metallic Red, Metallic Green & Metallic Silver. Imprint area - 1" x 1/2". Imprint Area :1" x 1/2"
Product Size :2 5/16" x 1 3/16"